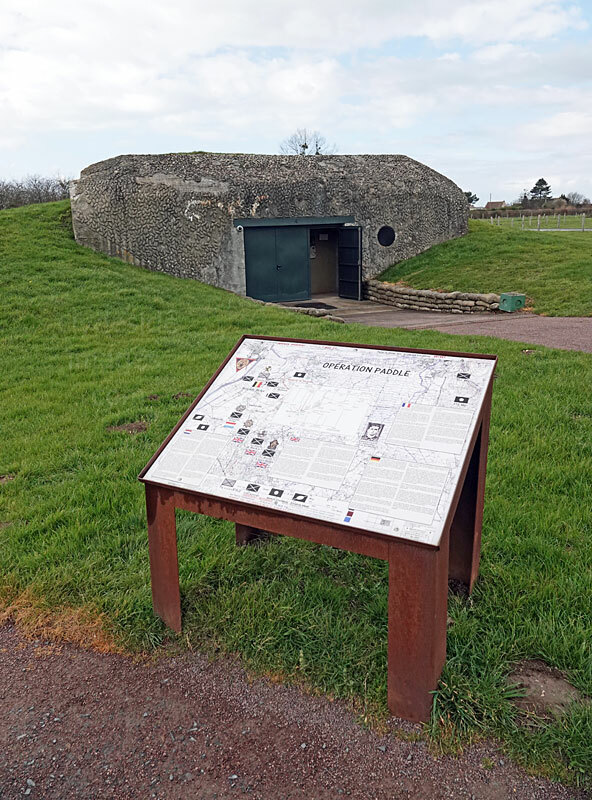 The Merville Gun Battery was a formidable coastal fortification forming part of Hitler’s Atlantic Wall, and due to the potential threat it posed to invading Allied forces it had to be neutralised and captured before the landings went ahead. 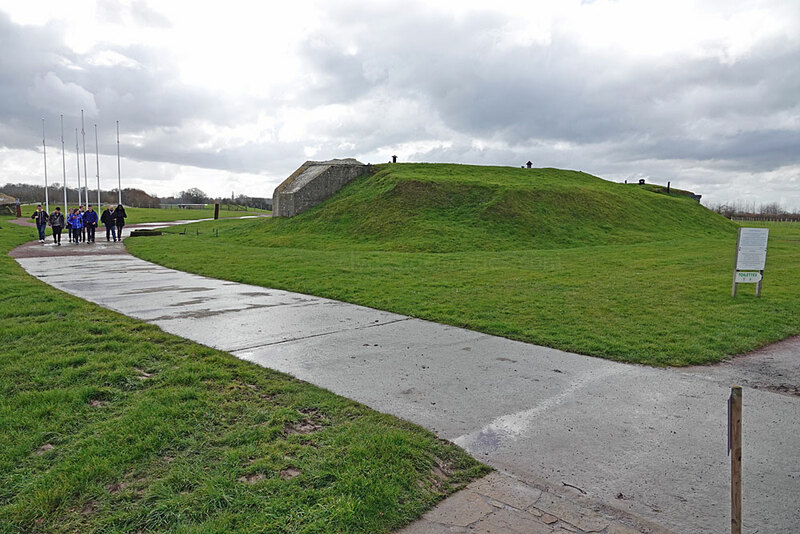 Intelligence suggested that the reinforced concrete emplacements housed four 155mm guns but these had actually been replaced by older, less powerful but still deadly guns. 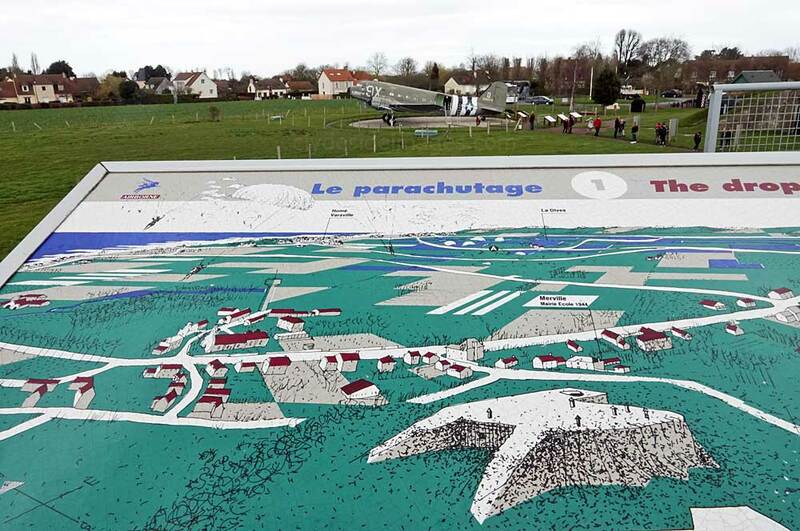 Two brigade groups of the British 6th Airborne Division would make a night drop and attack and secure not just Merville, but other strategically important locations inland from the beaches. 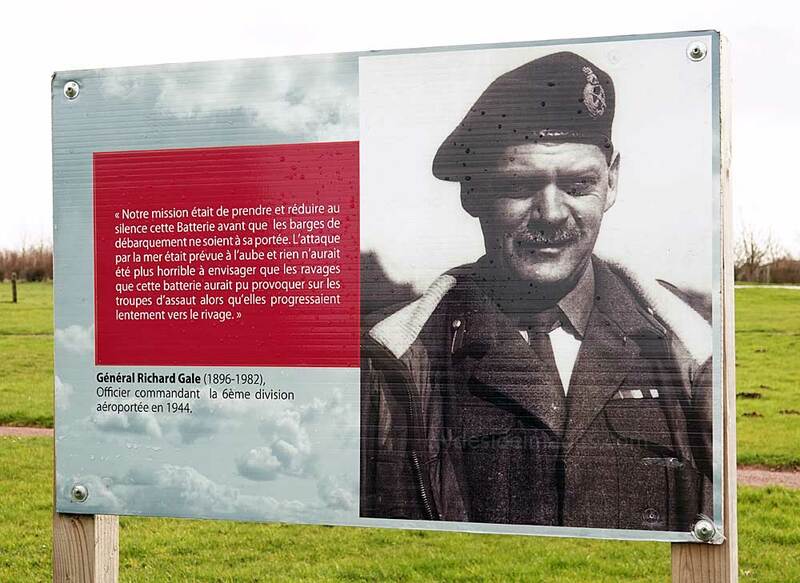 The British airborne element on D-Day was provided by the 3rd Parachute Brigade Group commanded by Brigadier James Hill, comprising the 1st Canadian Parachute Battalion, 8th and 9th Parachute Battalions, plus support units. It was imperative that the Paras destroyed the battery at Merville before the first landing craft were due on SWORD Beach and if confirmation of success hadn’t been relayed to the approaching armada by the allotted time, the light-cruiser HMS Arethusa (26) would endeavour to obliterate the site with her 6 inch guns. 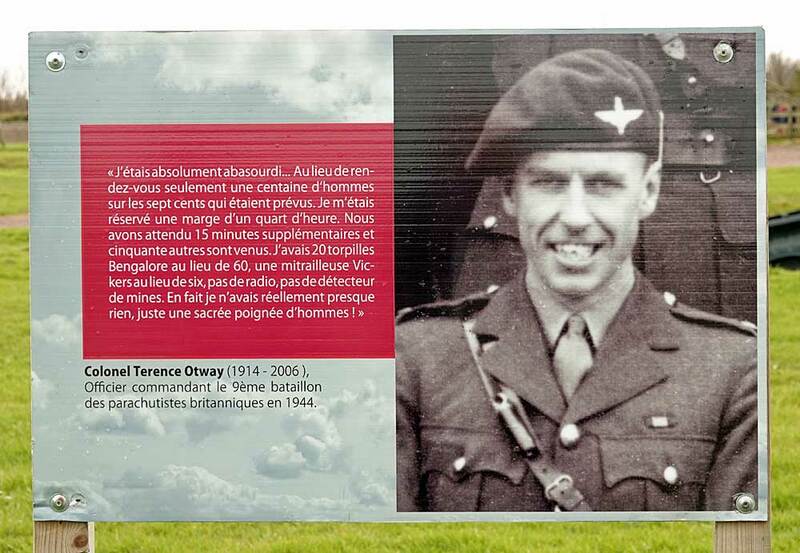 ​Lieutenant-Colonel Terence Otway was to lead the complex assault, which was to be preceded by a high-level bomb drop by a hundred Lancasters. I took the following shot during an Airshow at Prestwick Airport in 2014. Prior to this, the last time two of these iconic bombers had flown together was back in the 1960s. More than 7,377 Lancasters, 430 of which were built in Canada under licence, were produced during the Second World War but most of those that survived were scrapped. This rare colour photo was taken in April 1944 and shows the interior of a glider during a training jump. 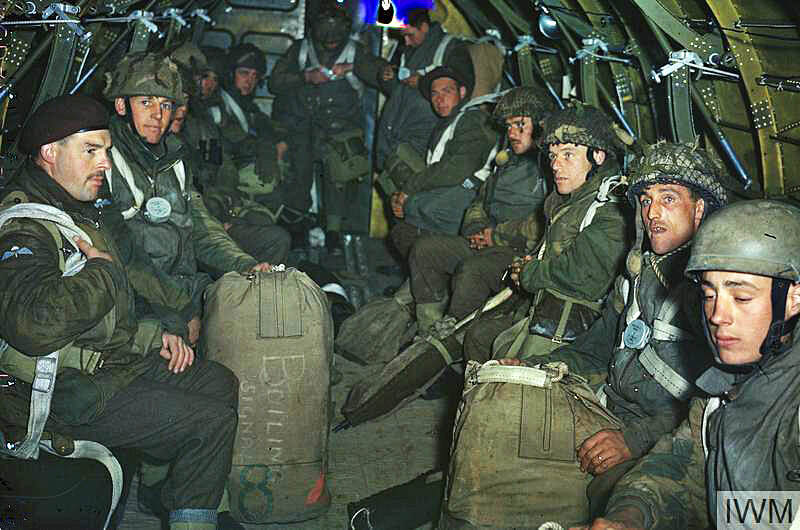 No doubt many of these men would have participated in the British Airborne missions during the early hours of 6 June. 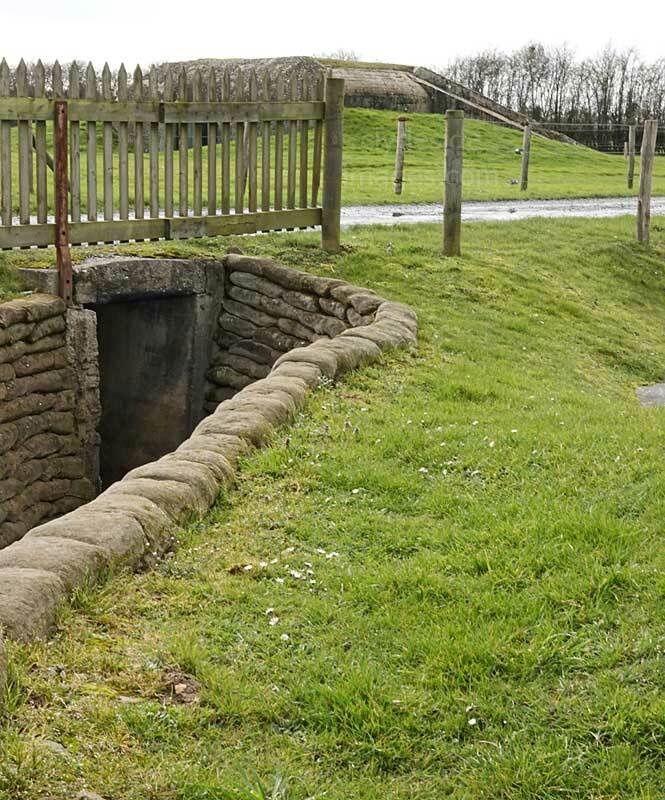 The Paras and accompanying Sappers tasked with capturing Merville would clear gaps in the wire and minefields and attack the casemates while three gliders would crash-land in the perimeter simultaneously bringing additional men to the fight. 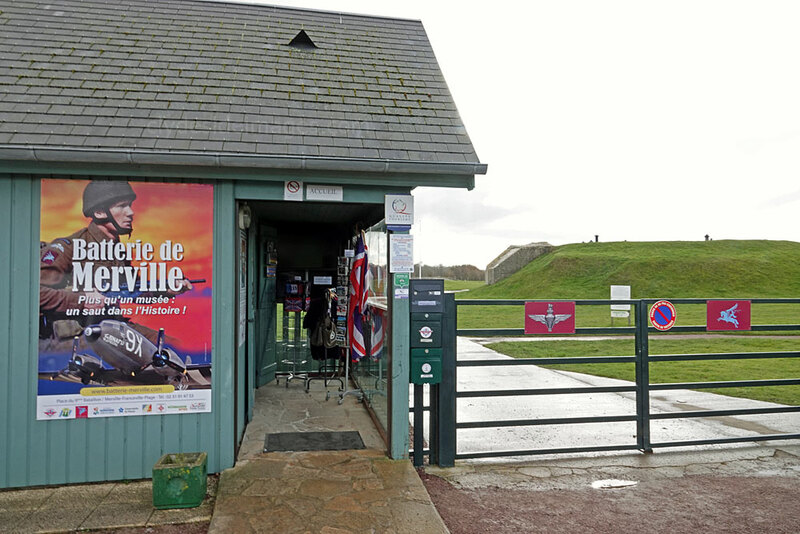 The entrance to the Merville Battery Museum site is via this small gift shop / ticket office.​..
​Portraits of some of the main players in the battle for Merville including General Richard `Windy` Gale (1896-1982), Brigadier James Hill (1911-2006) and Colonel Terence Otway (1914-2006) are positioned around the site on boards with background information in French. There is also an individual memorial (below right) to Otway with a superb bronze bust as its centrepiece. 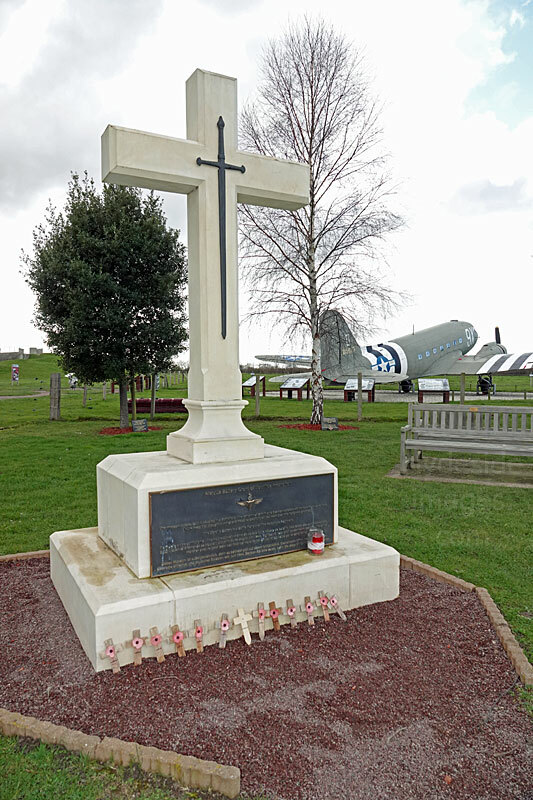 `Operation Tonga` began at 22:56 hrs on the night of 5 June, when six Handley Page Halifax heavy bombers took off from RAF Tarrant Rushton towing six Horsa gliders carrying the coup-de-main force; this consisted of D Company, 2nd Battalion Oxfordshire and Buckinghamshire Light Infantry (part of the 6th Airlanding Brigade, but attached to the 5th Parachute Brigade for the initial invasion) reinforced with two extra platoons from B Company and a party of Royal Engineer sappers under the overall command of Major John Howard, who were tasked with capturing the bridges over the Caen Canal and the River Orne. 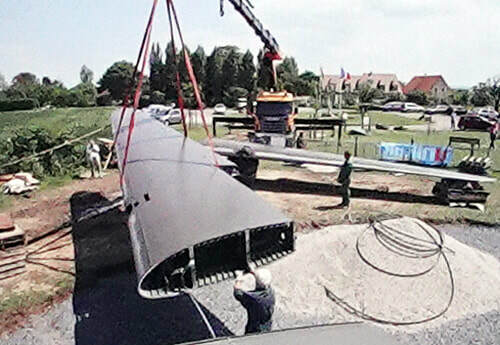 (See Pegasus Bridge page). 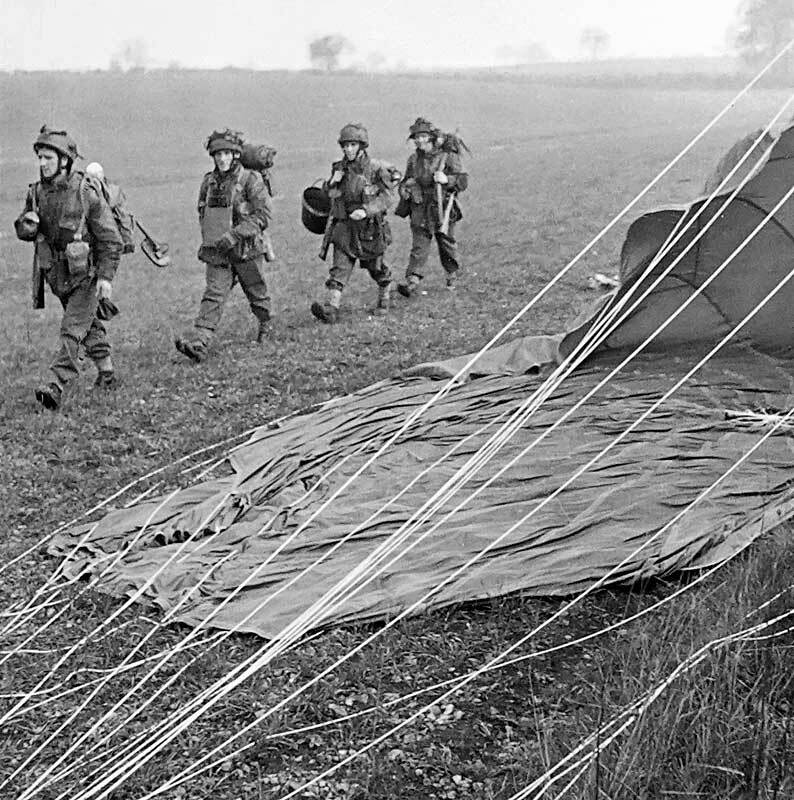 A few minutes later, between 23:00 and 23:20 hrs, six Armstrong Whitworth Albemarle transports took off carrying pathfinders of the 22nd Independent Parachute Company, who were to mark the three drop-zones to be used by the division`s follow-on airborne troops. Another sixteen Albemarles followed the transports carrying the pathfinders, these transported elements of the 9th Parachute Battalion, 1st Canadian Parachute Battalion, and 3rd Parachute Brigade Headquarters. 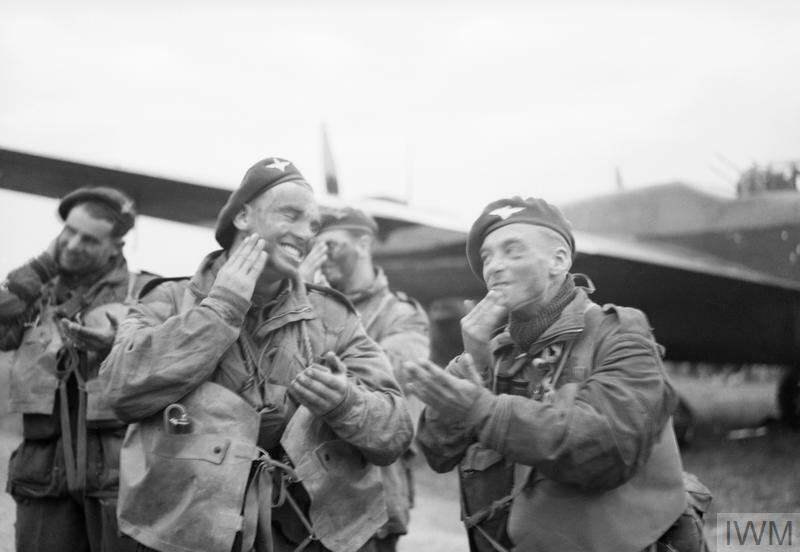 The above posed shots, taken at RAF Harwell on 5 June, show Paratroops of 6th Airborne Division blackening their faces in front of an Albemarle transport. 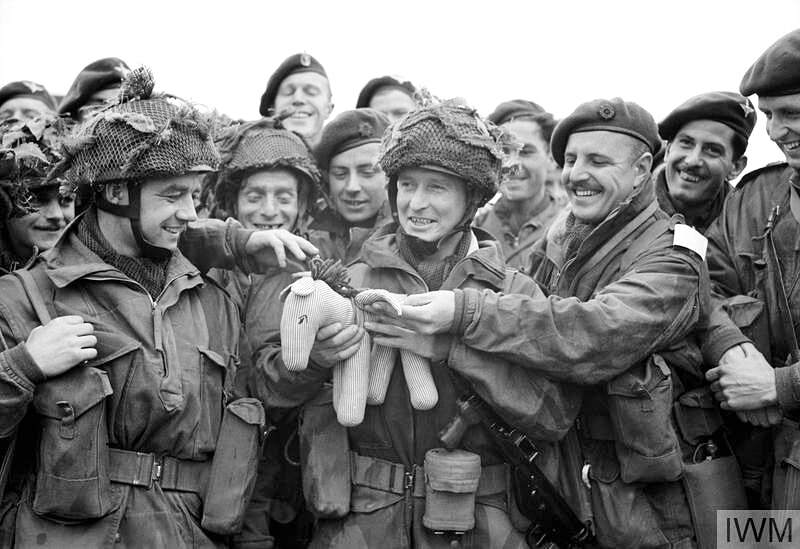 The 22 Independent Parachute Company`s toy mascot 'Pegasus' is also getting ready for action. Right: S​hort Stirling Mark IVs of Nos. 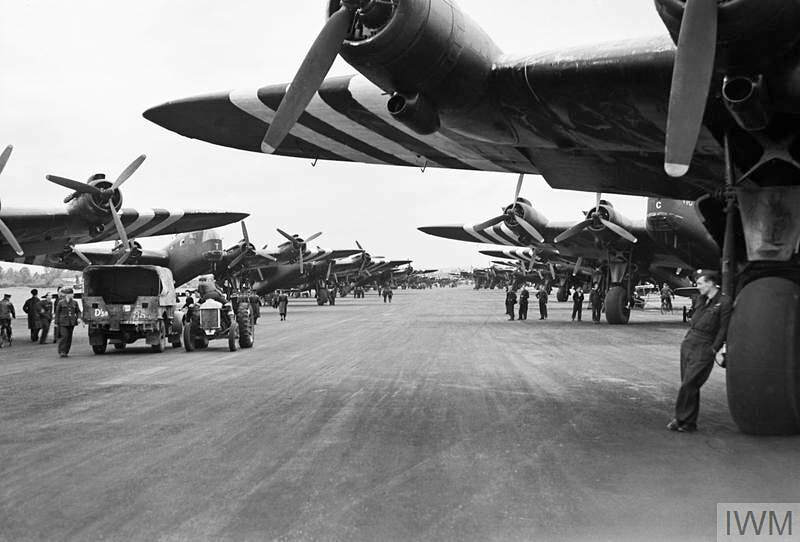 196 and 299 Squadrons RAF, lining the runway at Keevil, Wiltshire, on the evening of 5 June, before emplaning paratroops of the 5th Parachute Brigade Group for the invasion of Normandy. This wave was divided into three groups. 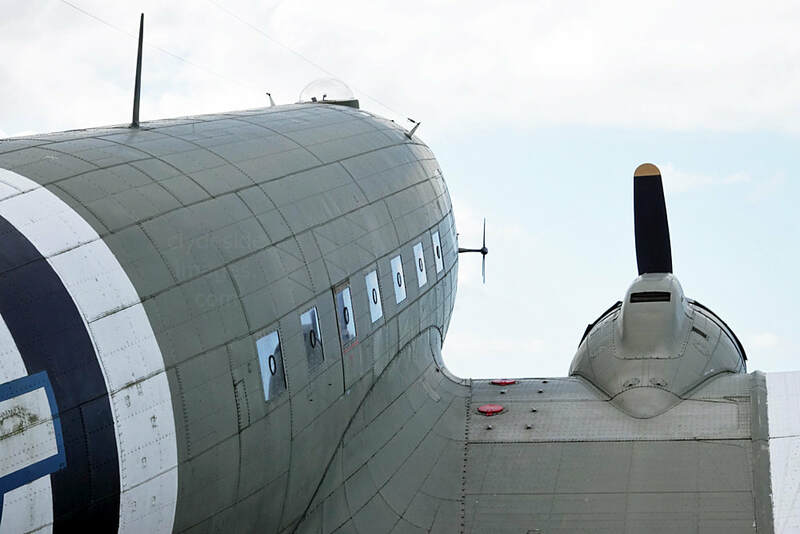 The first consisted of 239 Douglas Dakota and Short Stirling transports, as well as seventeen Horsa gliders, carrying the bulk of the 3rd and 5th Parachute Brigades and their heavy equipment. The detail above is from a mural at the Pegasus Memorial. 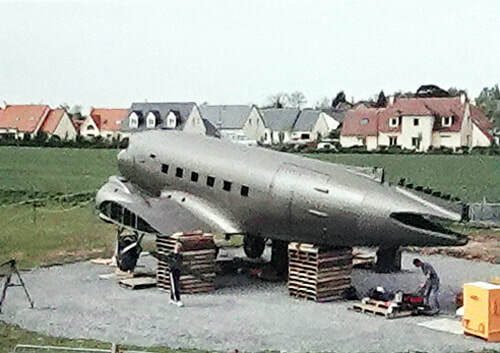 Merville`s painstakingly restored C-47 ‘The SNAFU Special’, which was put on display here on 7 June 2008. 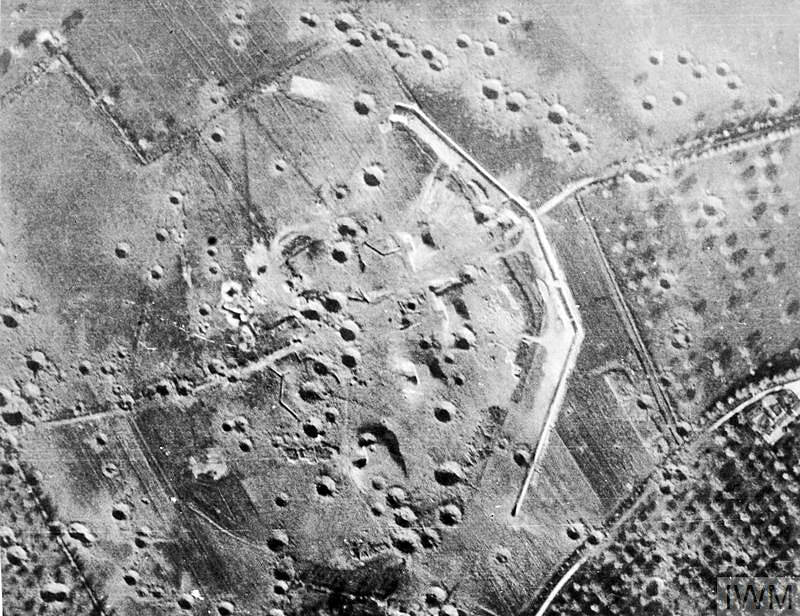 ​Below Right: This reconnaissance view of the gun battery at Merville (3km east of Ouistreham) was taken sometime in May 1944 after an aerial bombardment failed to penetrate the casemates. 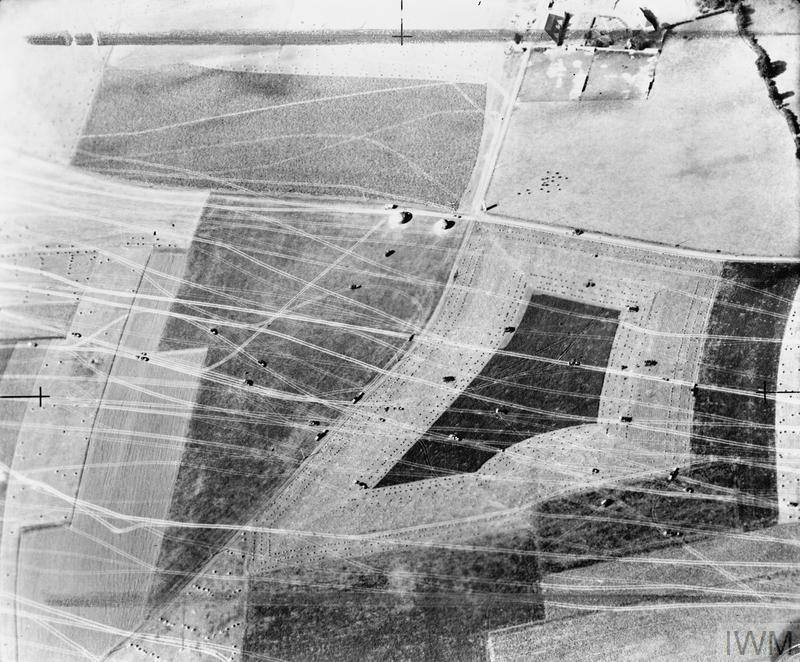 The failure of this and similar air attacks confirmed that the site could only be neutralised by Paras on the ground. The D-Day mission, however, got off to a bad start. The first problem was that due to a navigational error, the Lancasters making a last minute raid, deposited their bombs well away from the target. 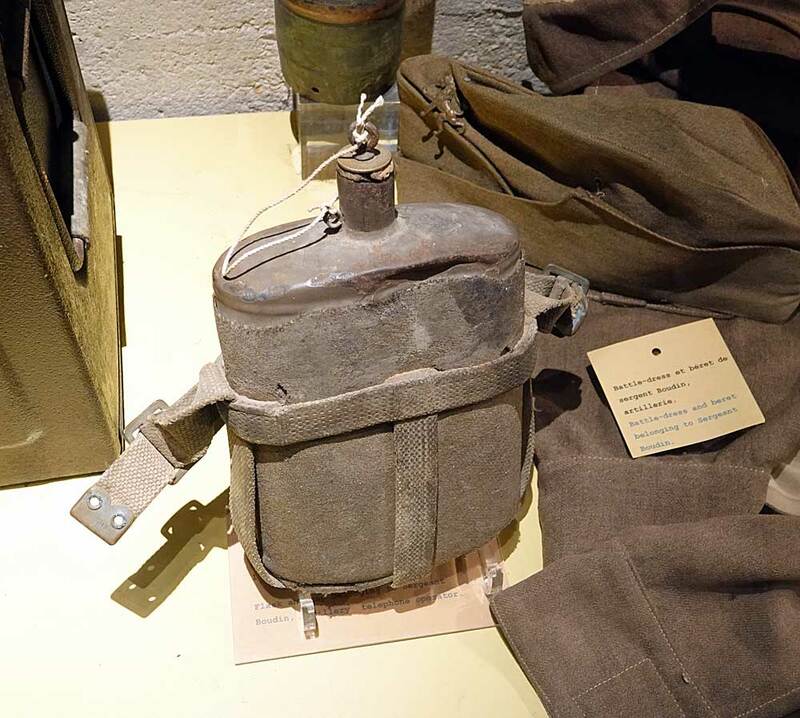 Then, two hours after the airborne drop, Otway could only assemble 150 men for the attack, just a quarter of his force, with no engineers or mine-clearing equipment, but he decided to stick to the original plan. 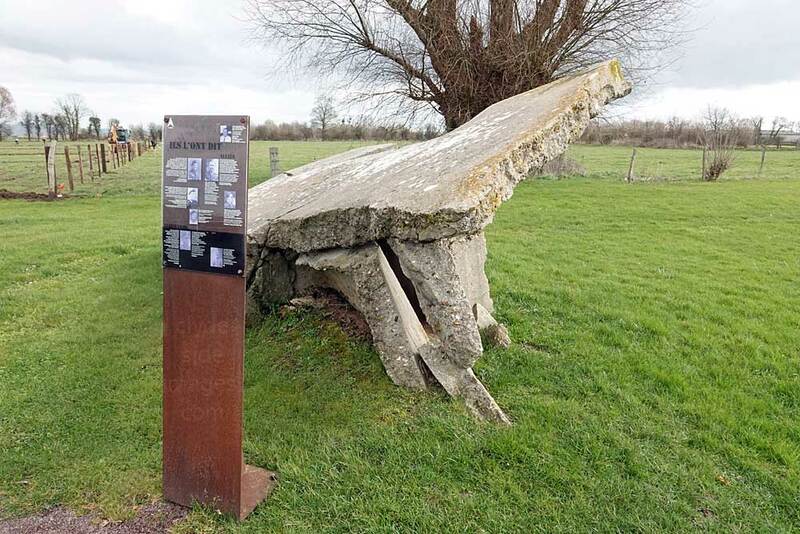 ​By this time of course, six gliders attached to 5 Para, with a contingent of the Oxford & Bucks Light Infantry, had famously captured the bridges over the River Orne and Caen Canal, crossings subsequently named Pegasus and Horsa, in a textbook operation when D-Day was just minutes old. Otway`s attack went in but the German’s defended stubbornly and a bitter fight followed. 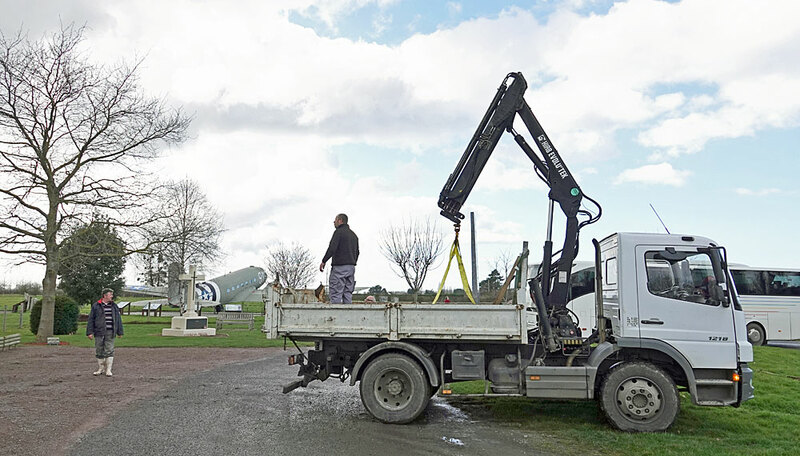 Just one of the three gliders reached the Battery at the allotted time, only to be hit by anti-aircraft fire which caused it to crash in an orchard to the southwest. The above image shows a defender`s eye view from a hatch on top of one of the bunkers. 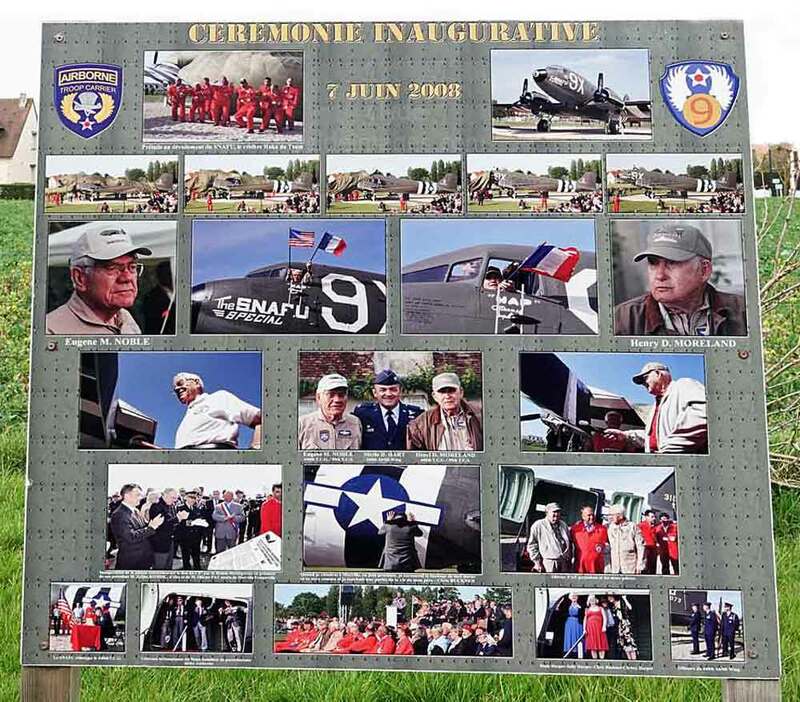 The above slideshow features more general views of the site, the layout of which has not changed significantly since D-Day. 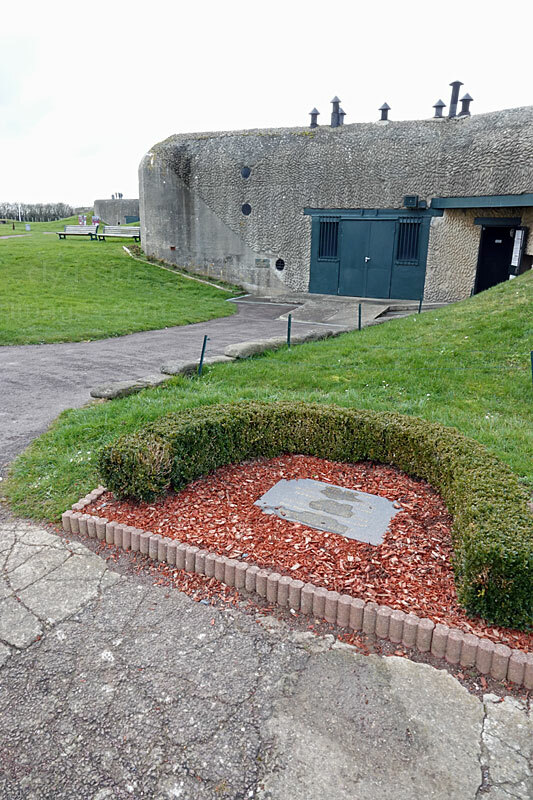 A viewing platform has been built on top of one of the casemates which provides a 360 degree panorama of the entire complex. Otway`s Para`s persevered and the guns were put out of action, however, losses were severe. Apart from those killed or wounded in the assault, hundreds of the troopers had been dropped into the flooded areas bordering the Dives River and many drowned. Those that were able began to form up, get their bearings and move towards their objectives or set up perimeters to protect the landing zones for additional waves of gliders carrying reinforcements. 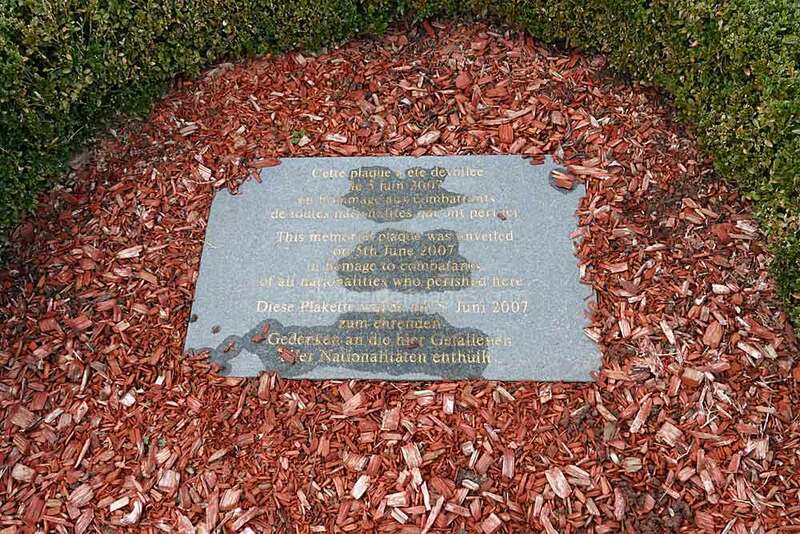 "This memorial plaque was unveiled on 5th June 2007 in homage to combatants of all nationalities who perished here." 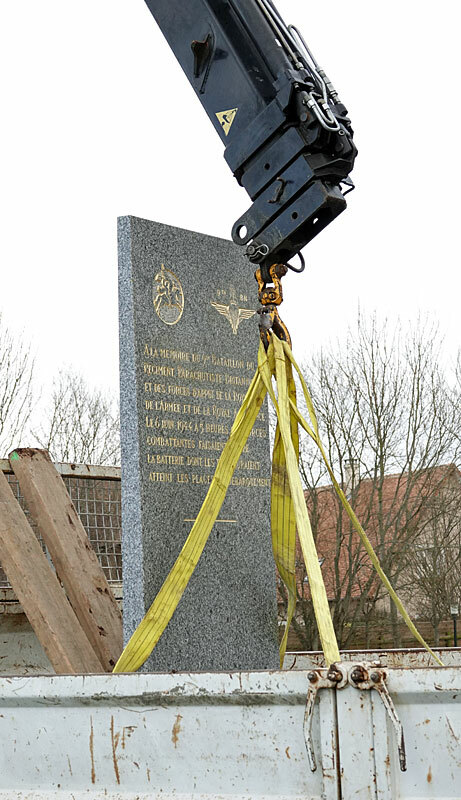 New memorials relating to the D-Day landings are being commisioned all the time. 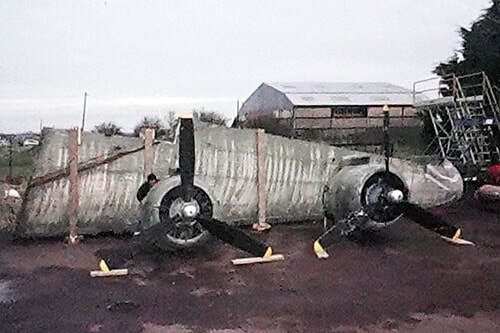 This one at Merville was being unloaded as I left the site. 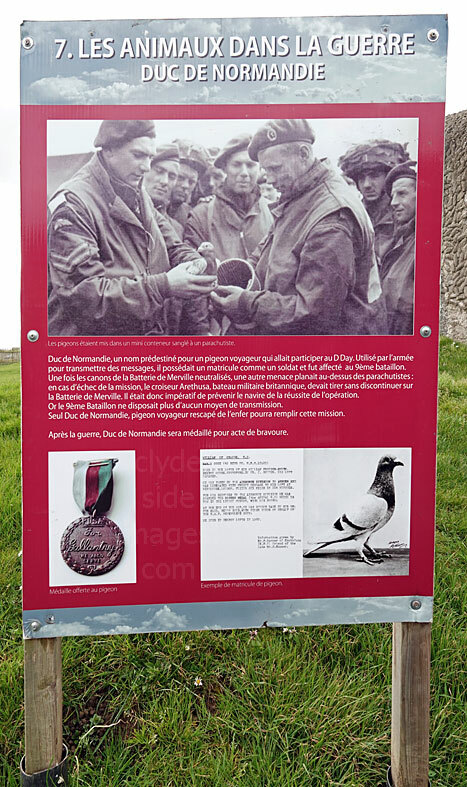 Pigeons were released at Merville as a backup to signal success prior to the commencement of the naval bombardment. 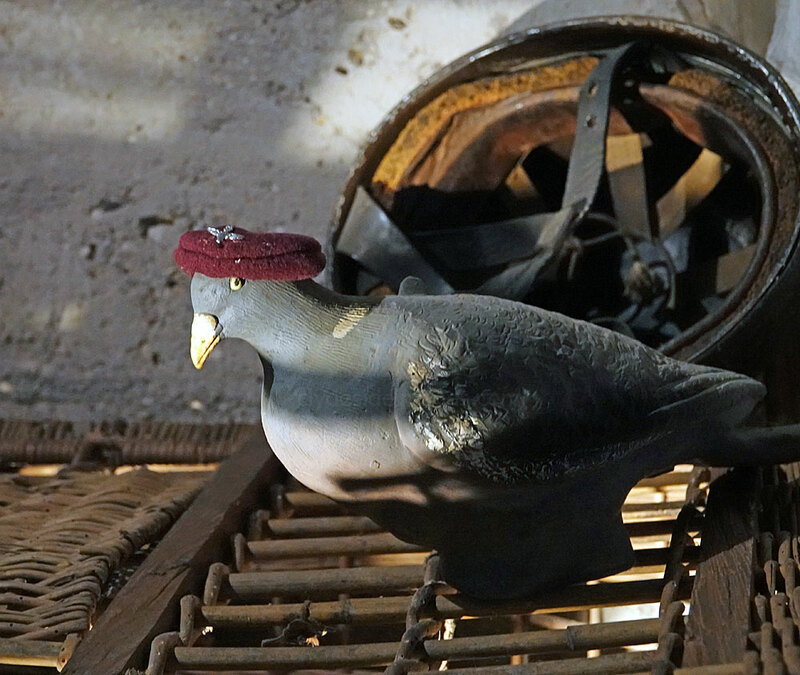 There aren`t many places where you can find a carrier pigeon wearing a Paratroopers` red beret but the Merville Battery is one of them. The photo above features William of Orange V.C. 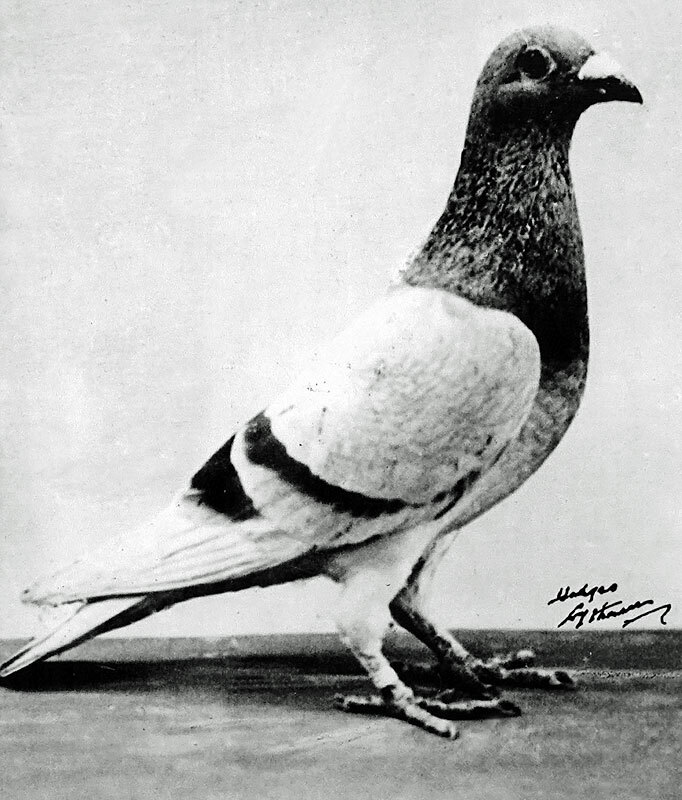 This award-winning feathered member of the Airborne Division was bred in the lofts of Sir William Proctor-Smith of Bexton House, Knutsford, by Mr J. Sumner, his Loft Manager. 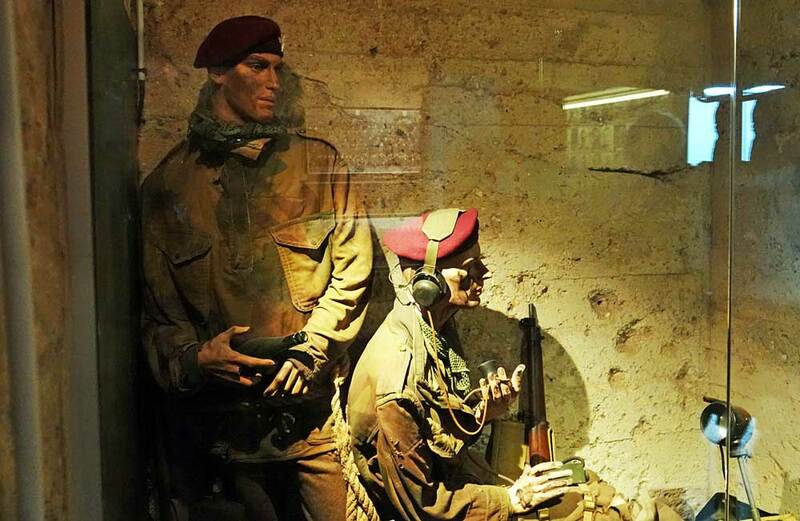 ​​The bird was taken by the British Airborne forces to Arnhem where radio operators struggled to get a signal with the limited number of short-range sets available. 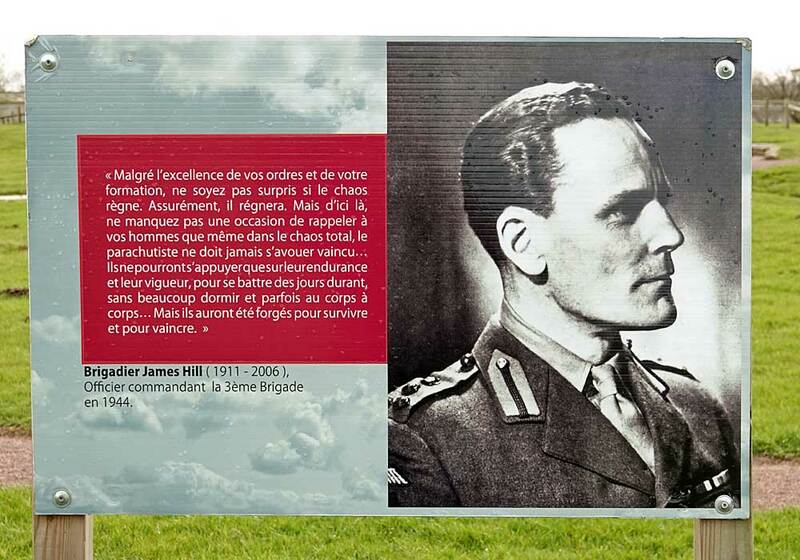 `William` was released to fly back to the UK with an urgent message reporting the Paras` precarious situation as they fought off repeated German attacks. He reached his loft in 284 minutes having flown 283 miles. 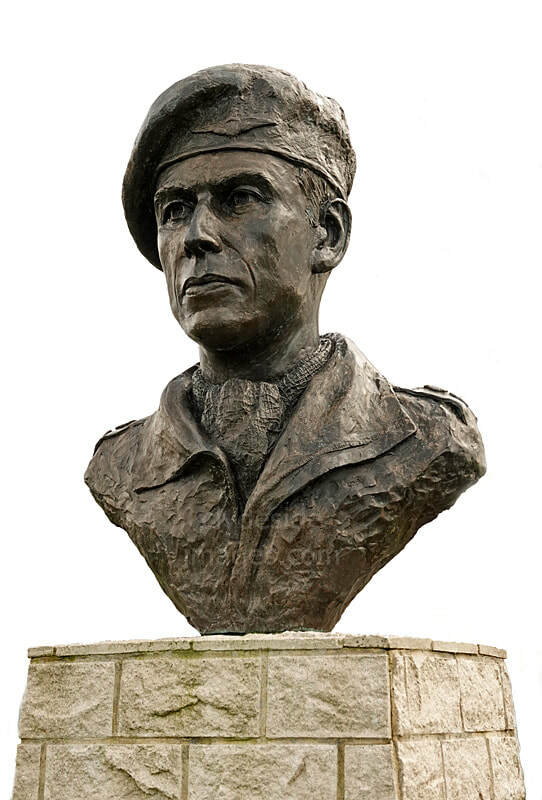 ​For his services to the Airborne Division, he was awarded the Dickin Medal, often referred to as the Animal Victoria Cross. His award, along with his portrait is now on display within the London Museum. At the end of the war, he was bought back by Sir William for £165, having been sold along with other birds to raise funds for the RAF Benevolent Society. The remarkable bird lived the rest of his life in the lofts at Knutsford until his death in 1960. 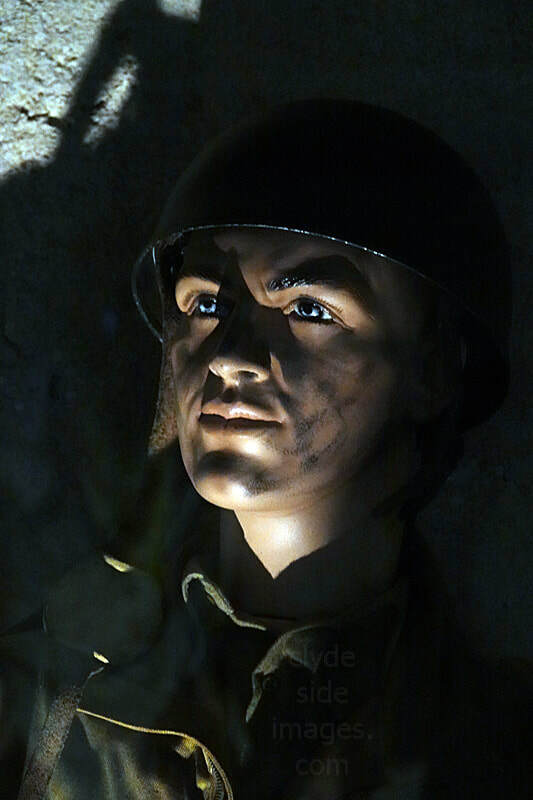 One of the casemates has a half-hourly ‘sound and light’ experience with figures representing German artillerymen engaging the Allied forces on D-Day with loud explosions and flashes which some visitors may find uncomfortable. I found it bearable for a little while, until a party of teenage school kids appeared, making more noise than the cannons! 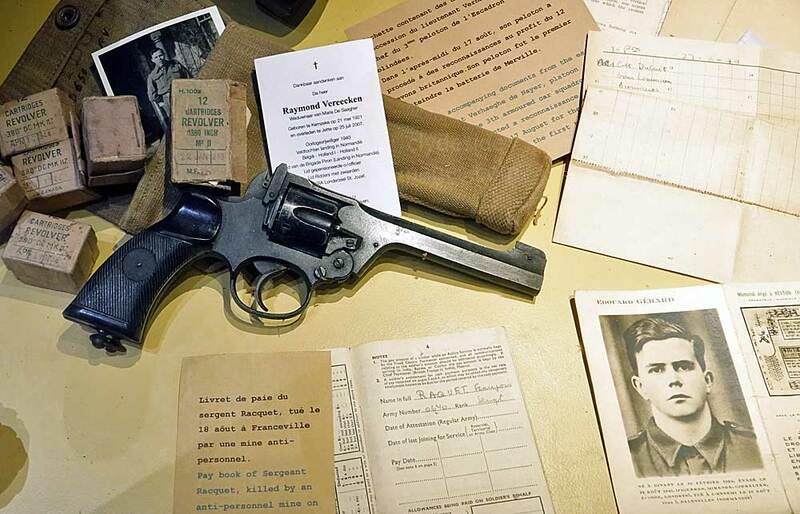 Just some of the items on display at the Merville Battery. A second mission for Hill’s Paras during the early hours of 6 June had been to destroy several bridges over the River Dives to prevent the Germans from attacking Ranville where men of the 5th Parachute Brigade were clearing landing zones to the north, to assist the rapidly approaching main glider force. 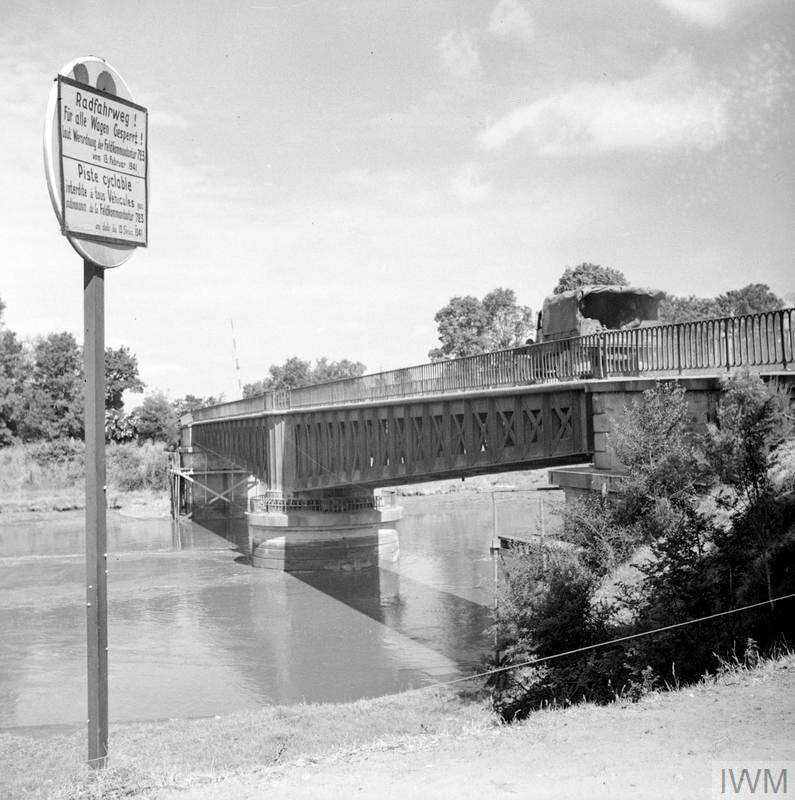 The view on the right shows a lorry from the British Army`s 3rd Division crossing the Orne River bridge (`Horsa Bridge`) between Ranville and Benouville on 8 June 1944. The bridge was captured by 6th Airborne Division in the early hours of D-Day. This is the view from the east. 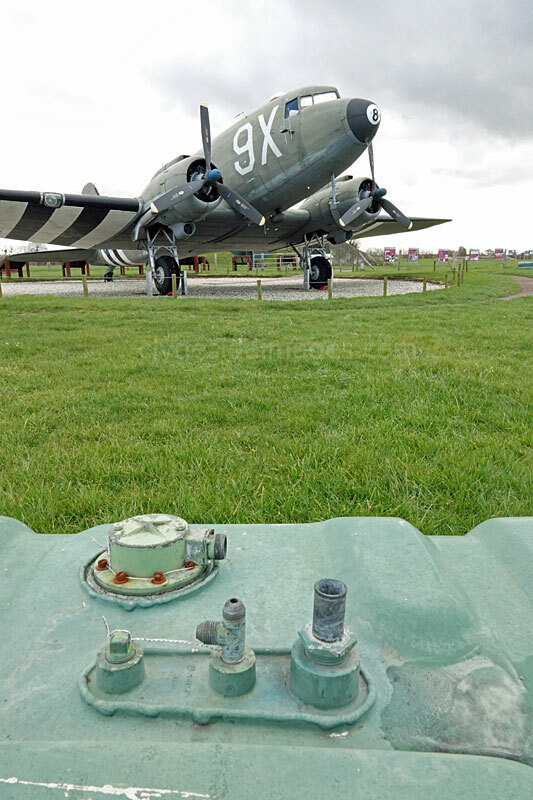 The Merville Battery is remarkably well-preserved and taking pride of place near the entrance is ‘The SNAFU Special’, a C-47 Dakota which, following a long restoration, was put on display here on 7 June 2008. 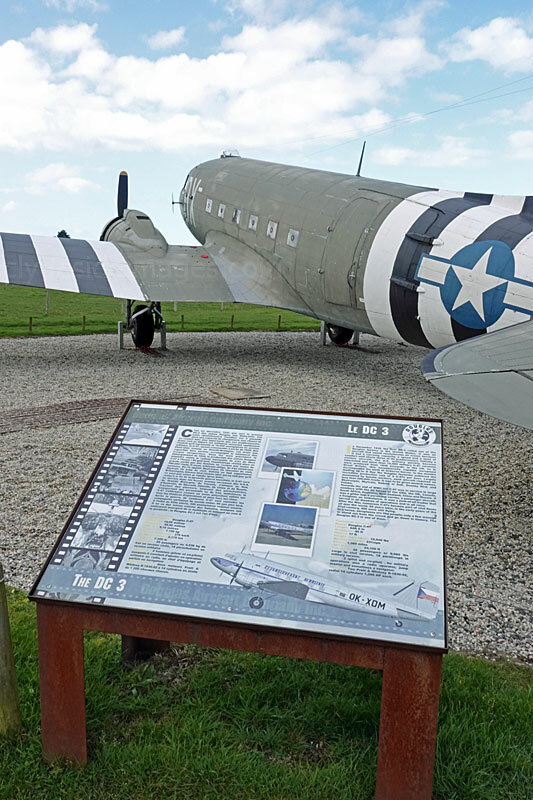 The boards next to the C-47 include information on the history of the aircraft which left the Douglas factory at Long Beach, California, on 29 January 1944, having been allocated the serial number 43-15073. 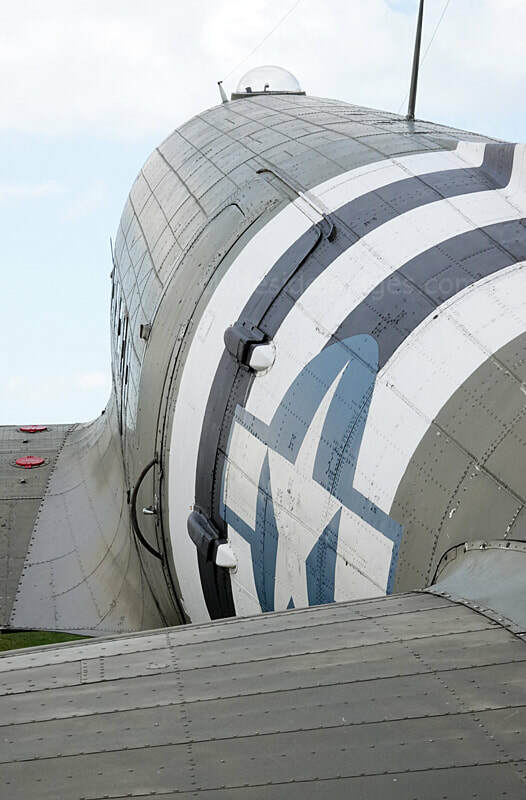 On arrival in Great Britain the plane joined the 440th troop Carrier Group and was used extensively to train US troops preparing for the invasion. 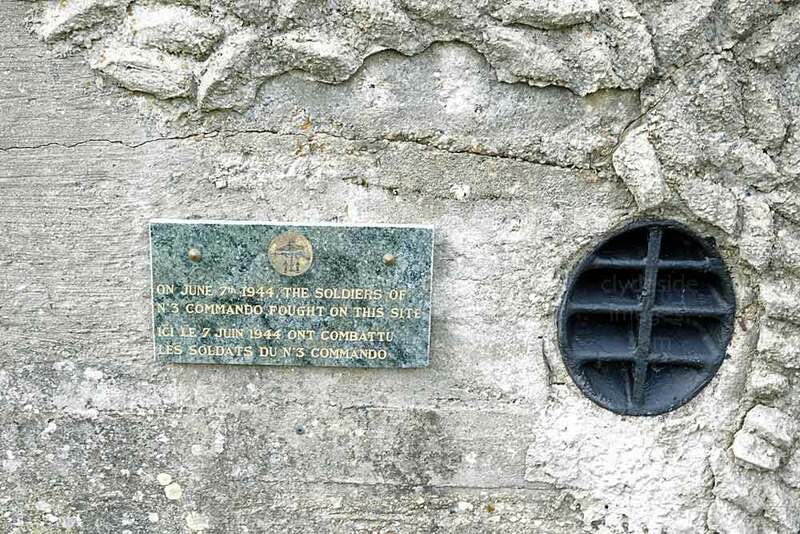 ​On the night of 5th/6th June 1944, the plane crossed the Channel and dropped men of the US 501st PIR (Parachute Infantry Regiment), 101st Airborne Division, just south of St-Mere-Eglise. 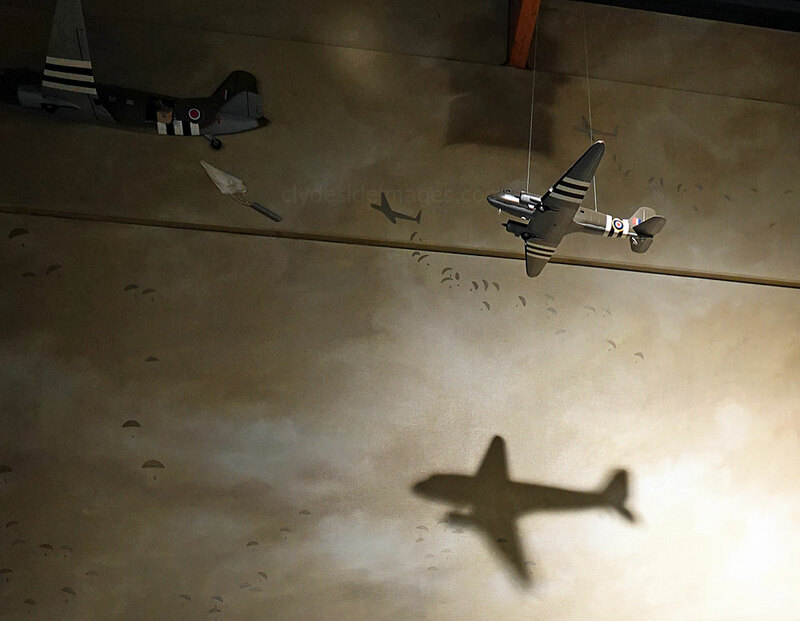 Throughout the entire Normandy Campaign, `SNAFU` flew numerous resupply missions to temporary airstrips, often returning to Britain with wounded soldiers. 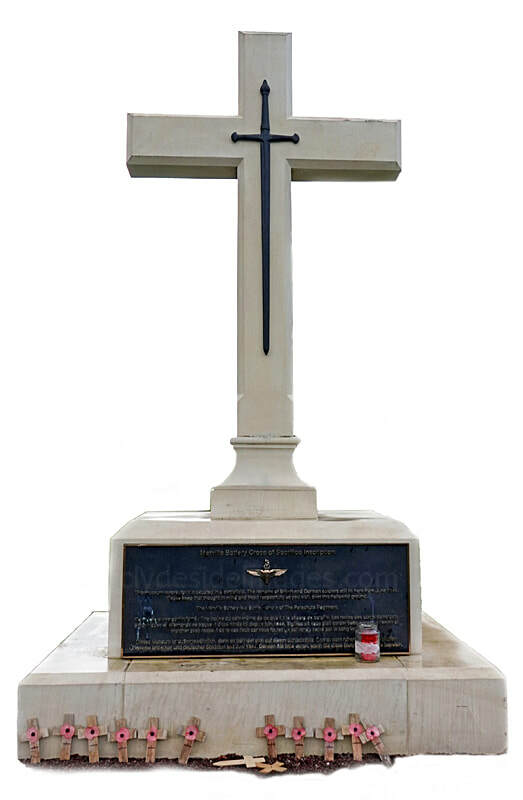 In September 1944, following operations in the south of France, she delivered men of the 82nd Airborne Division to Nijmegen during `Operation Market Garden`, immortalised in the film `A Bridge Too Far` directed by Richard Attenborough. Several months later, over Bastogne during the Battle of the Bulge, the plane and her crew narrowly avoided catastrophe after German anti-aircraft fire caused extensive damage. 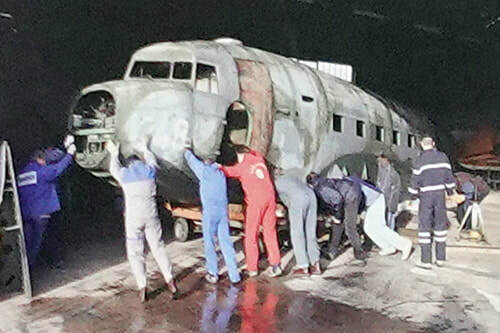 ​At the end of the war she was sold to the Czechoslovakian national airline, and after conversion for civil use became the operator`s `flagship`. 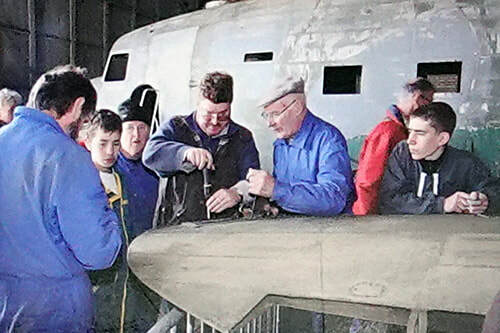 The aircraft was purchased by the French Air Force in March 1960, then re-sold in 1973 to the Yugoslav Air Force. Twenty years later, during the Balkans Conflict, in what was then Bosnia and Herzegovina, she was hit by machine gun fire whilst at the Rajlovac military base near Sarajevo, and remained grounded from then on, gradually rotting away. France was the first country to open an embassy in Sarajevo during the conflict, when the city was besieged. 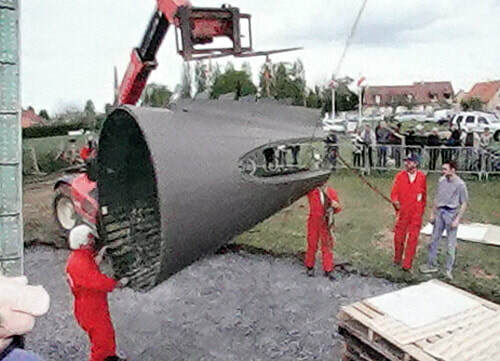 The French Army, as part of the United Nations Peacekeeping Force, was based in Rajlovac where the C-47 lay and, taking into account the plane`s historical ties with France, the Bosnian government donated it to the citizens of Merville. 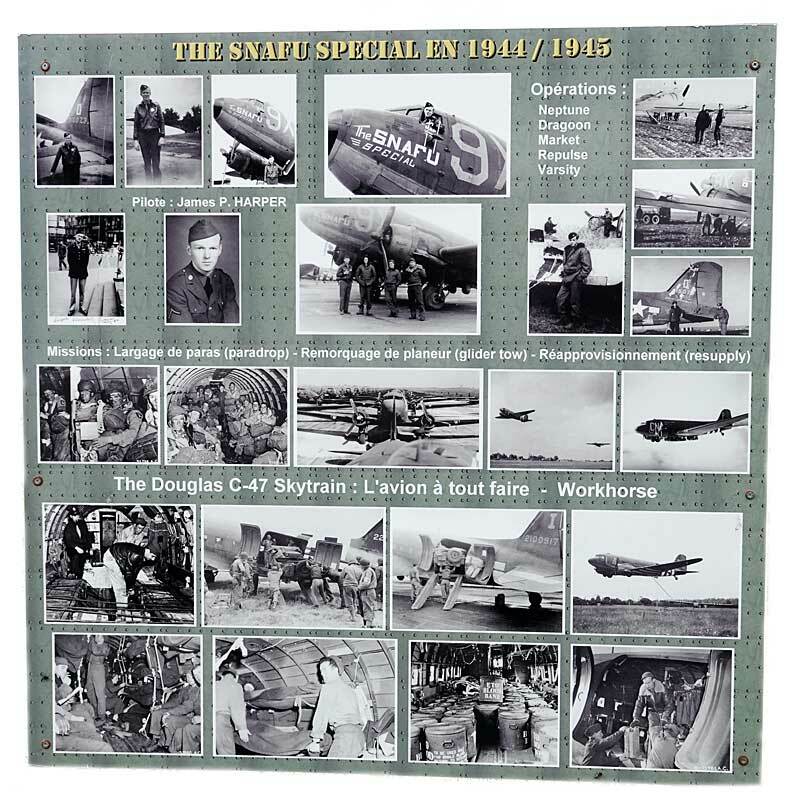 Additional panels show the SNAFU Special`s relocation and subsequent restoration in detail, as well as some images taken during the Second World War. 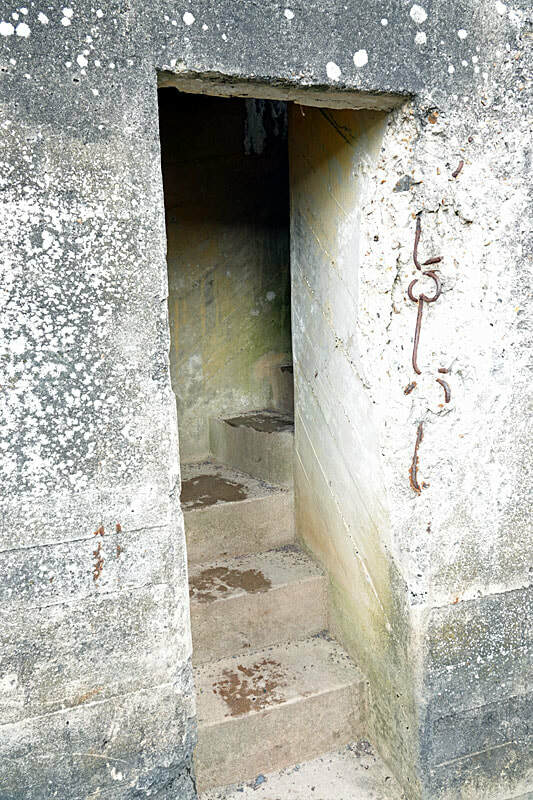 ​This was the battery cookhouse but it also had a 20mm Flak 38 Anti-aircraft gun installed on its roof. 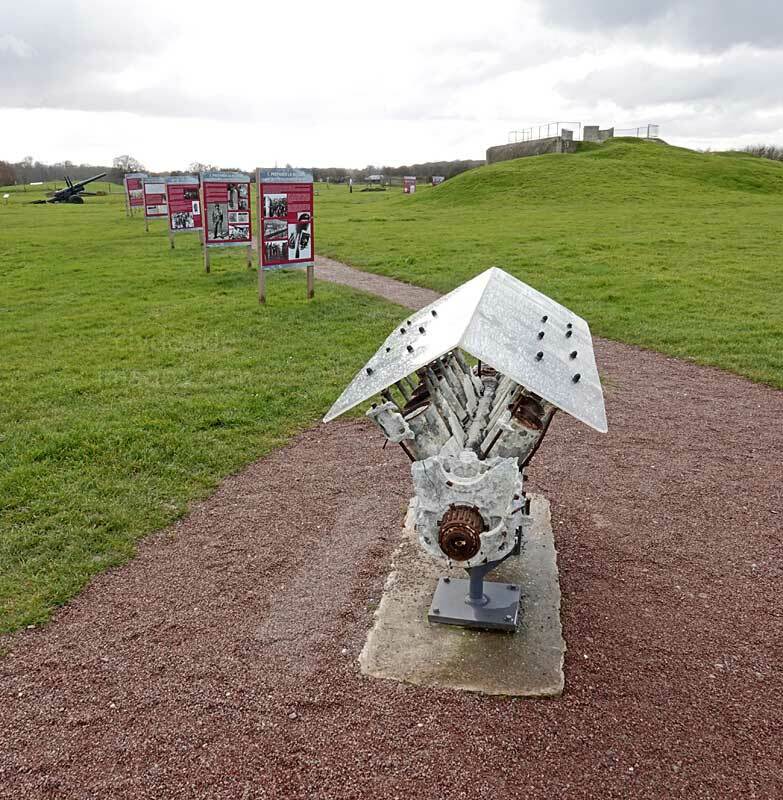 ​This Rolls Royce Merlin engine from a Spitfire was recovered from the seabed off Dives-sur-Mer and donated to the Merville Battery Museum in 2011. Please bear in mind that all images on this website are Copyright. They are not free to use and have been embedded with a digital watermark. 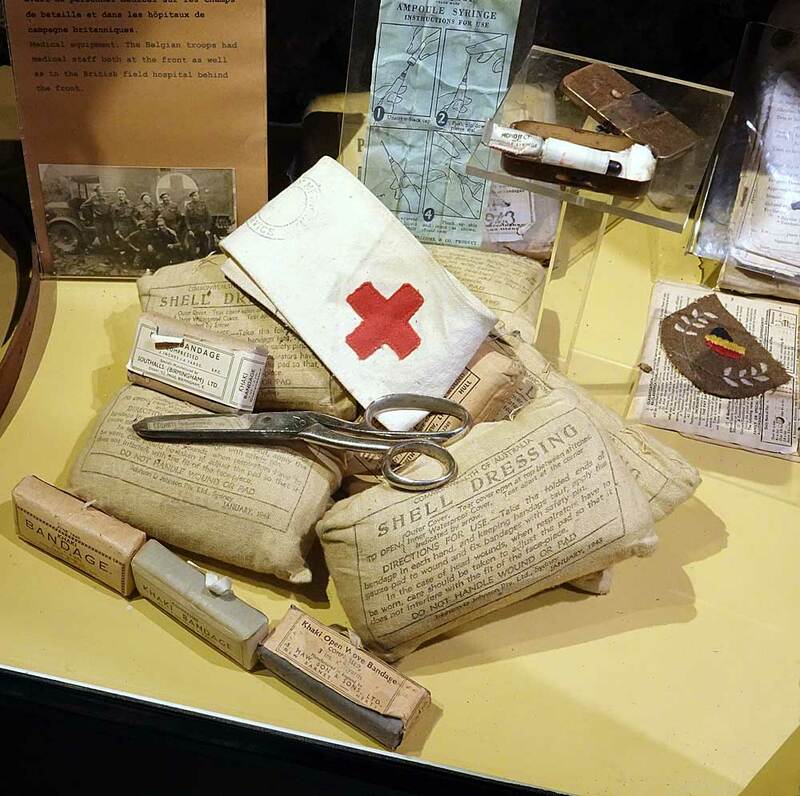 Any historic photographs from the Imperial War Museum and other organisations` collections have been used courtesy of a `Share & Reuse` policy and are also subject to copyright restrictions. 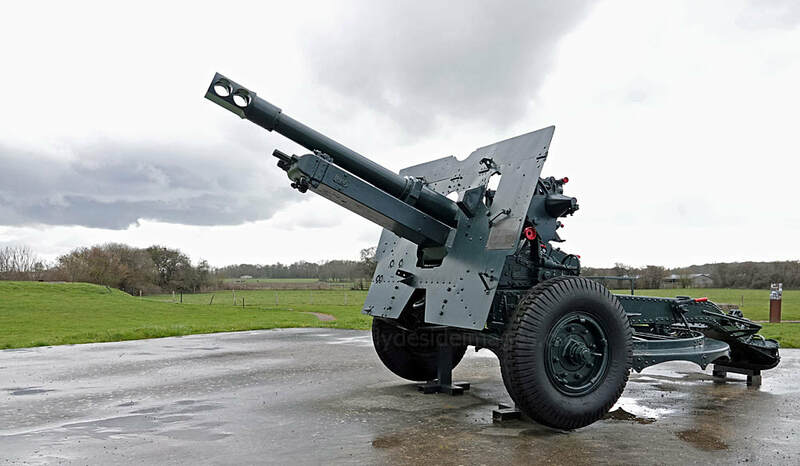 ​The Ordnance QF (Quick Firing) 25-pounder (above) was brought into service just before the outbreak of the Second World War and remained the British Army`s primary field gun well into the 1960s. The 25-pdr proved an effective weapon and an experienced crew could lay down a rapid and devastating barrage. ​The British mounted the gun on a Valentine tank chassis to produce the Bishop self-propelled gun and the Canadians created the Sexton which was mounted on a Ram or Grizzly tank chassis. 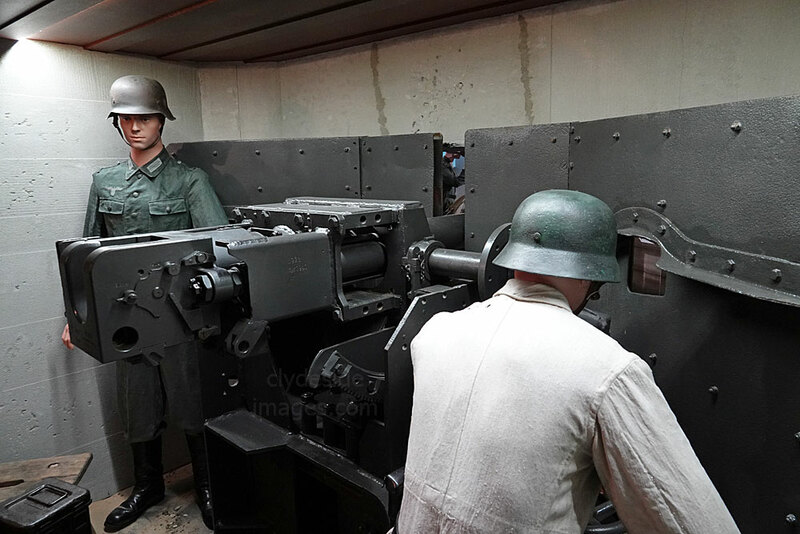 Both types of these SP guns were used in the Normandy Campaign. Above: The BL 5.5 inch gun became the British Army`s standard medium gun from 1944 onwards, having replaced the 4.5 inch Mark.1 gun. 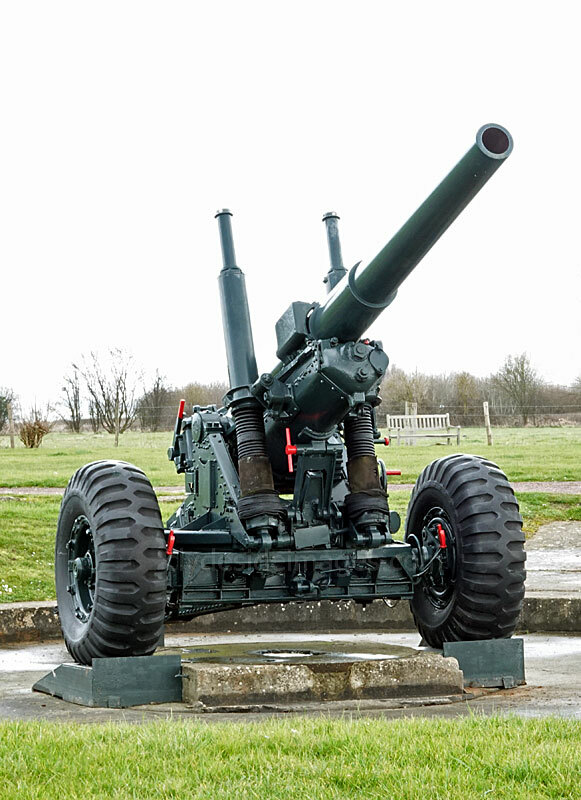 The larger weapon equipped most medium regiments of the Royal Artillery and could fire a 75lb standard charge up to 9 miles with a rate of fire of 2-5 rounds per minute. It was renowned for its accuracy and within 3 minutes of taking up firing positions, the crew of ten could bring the weapon into action. It was usually towed by a 4-wheel drive A.E.C. Matador artillery tractor which also carried the ammo, spares and essential tools. 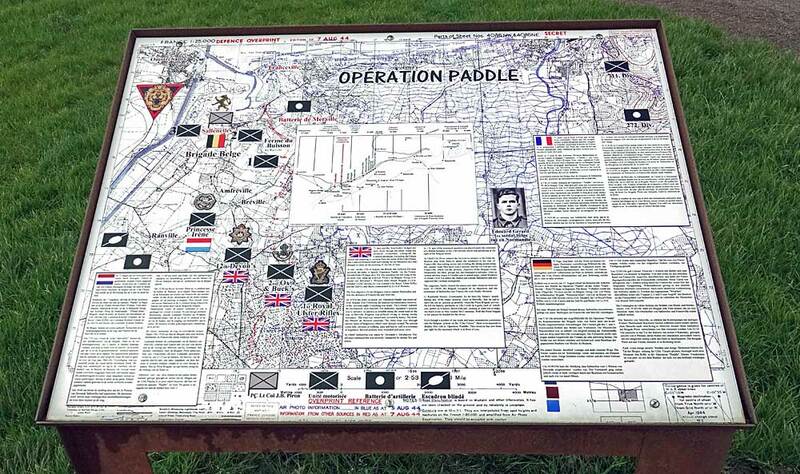 ​This panel relates to `Operation Paddle`, a British and Canadian offensive in mid-August 1944 following on from operations intended to close the neck of the ‘Falaise pocket’ and so trap a mass of German troops and armour, then in full retreat. 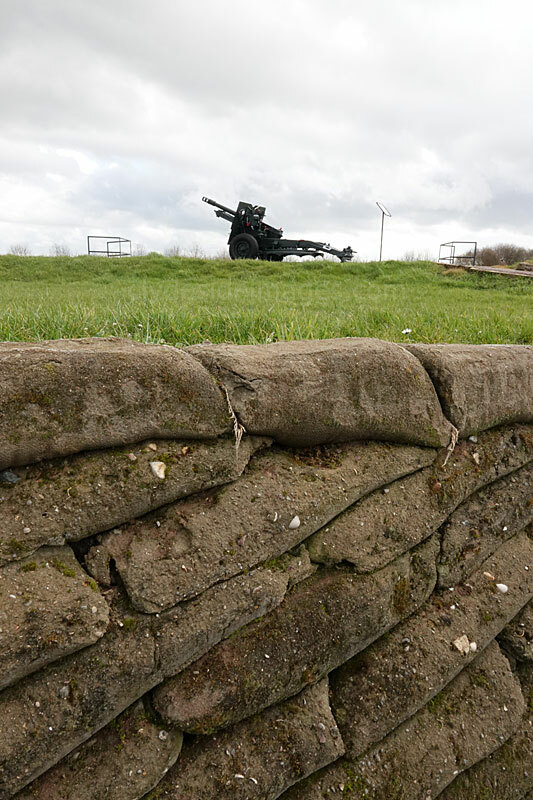 Rather than a rapid push inland in the weeks following D-Day, Allied troops struggled to make progress due to dogged German resistance but the US 12th Army Group to the west broke into open countryside after the collapse of German opposition. 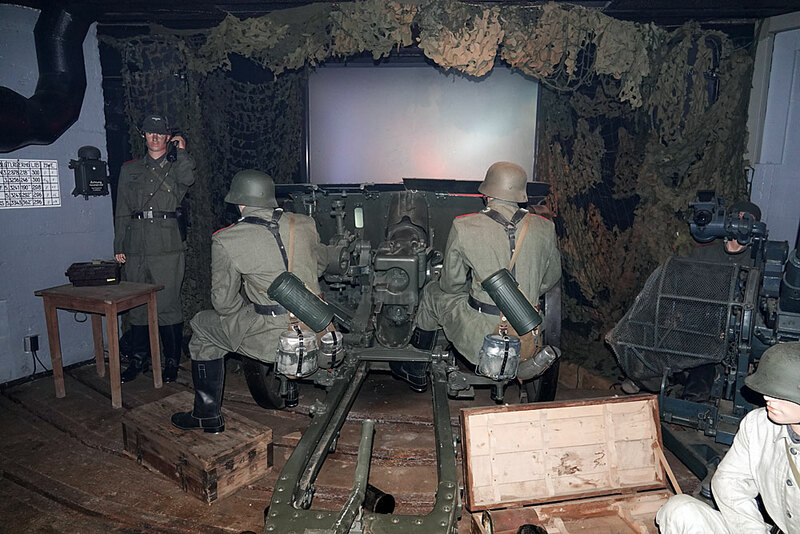 Adolf Hitler, despite the advice of his generals, insisted on a counterattack and shifted the weight of his forces westward at the very time when they should have been pulling back to the east to avoid encirclement. The Allied commanders Montgomery and Bradley moved to exploit the situation and the noose around the Germans slowly tightened under the combined pressure of the Americans and French in the south, the British in the west, and the Canadians and Poles in the north. ​The Allied fighter-bombers were able to roam freely, causing havoc among enemy troops as they made their desperate flight along what became known to the Germans as the ‘death road`. Late on 21 August, the German field commander ordered the remaining German troops in the pocket to surrender. Although perhaps 100,000 Germans had succeeded in escaping before the pincers closed, they left behind 150,000 prisoners, many of whom were wounded, and more than 10,000 dead. 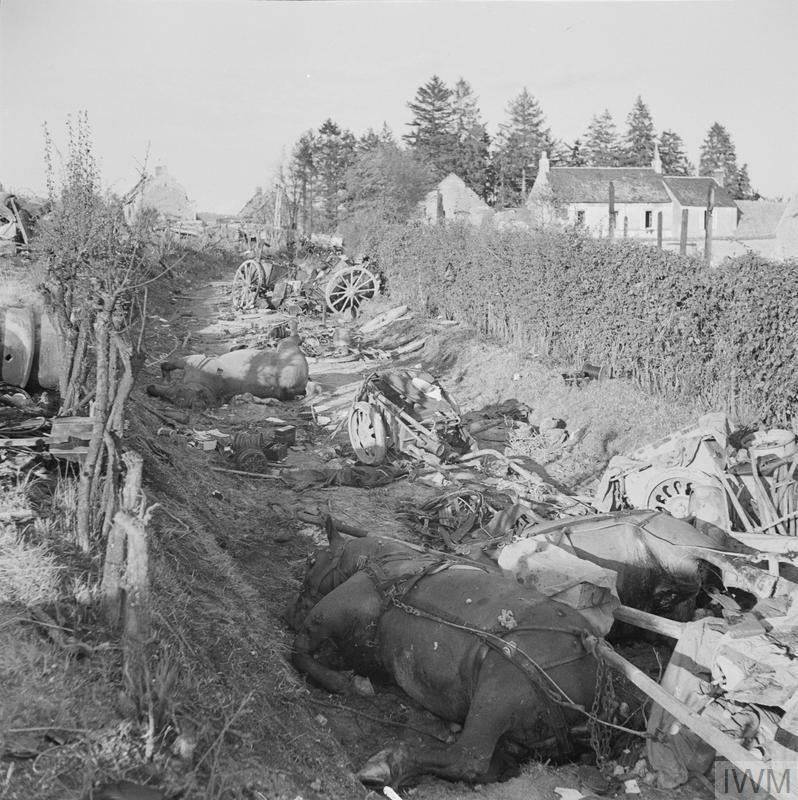 Long stretches of the main routes inland were practically impassable because of the number of destroyed tanks, wrecked vehicles, dead horses and human remains. 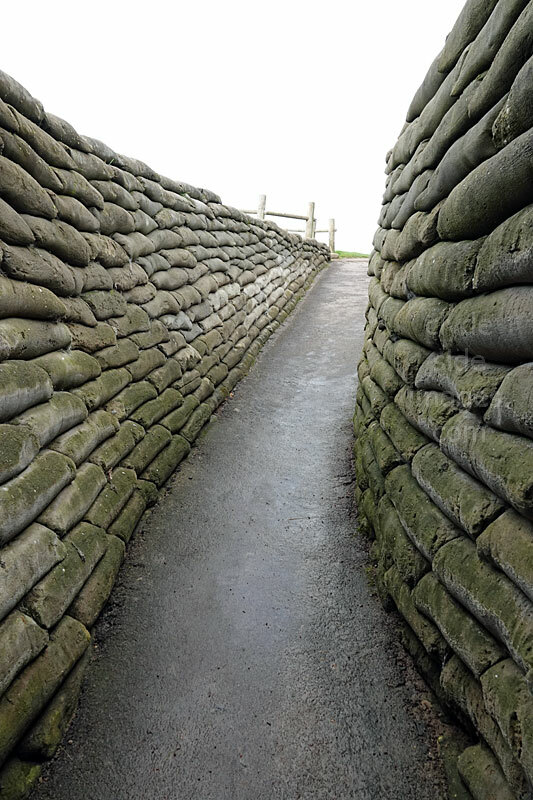 The Allies too suffered heavy losses, and many saw it as an opportunity missed due to the number of enemy troops which escaped to fight another day. 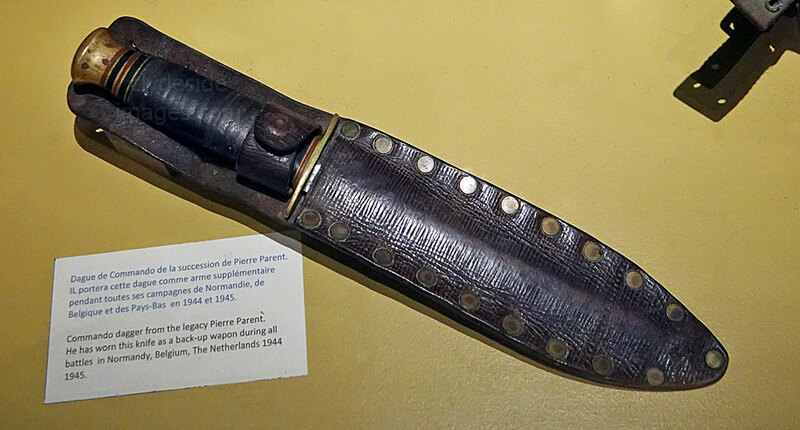 The First Canadian Army`s advance to the River Seine was called `Operation Paddle`. 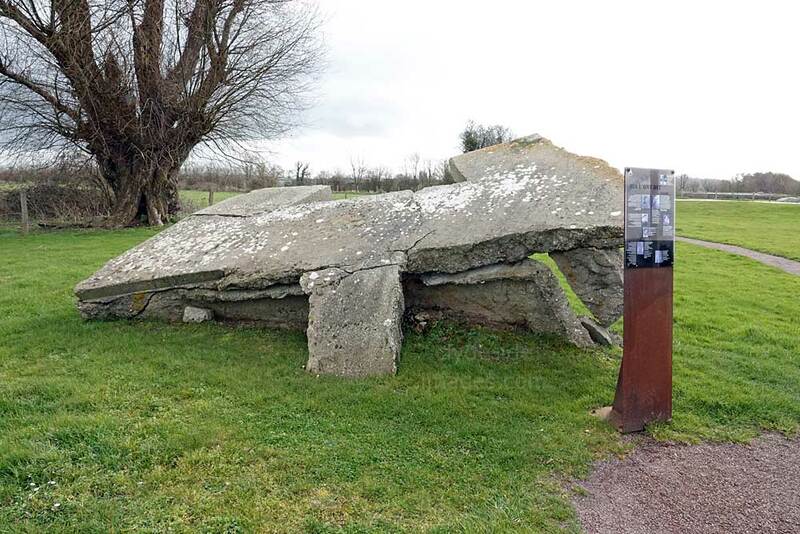 It had been hoped by the Allied commanders that a defeat comparable with the Falaise Pocket could be inflicted on the Germans by trapping them against the Seine and the sea. ​The American Third Army advanced northwards to cut off the route towards Paris but, despite the significant quantities of men and materiel already lost, the Germans once again resisted stubbornly. 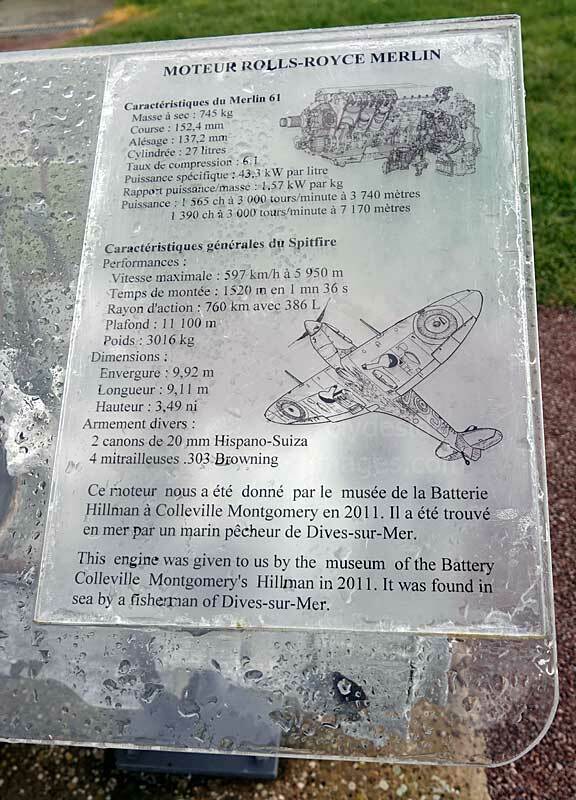 The British 6th Airlanding Brigade of the 6th Airborne Division took Honfleur on the Seine estuary but progress along the coast was slower than that inland, rivers being wider and more difficult to cross and the last of the German units west of the Seine weren`t finally cleared until 30 August.